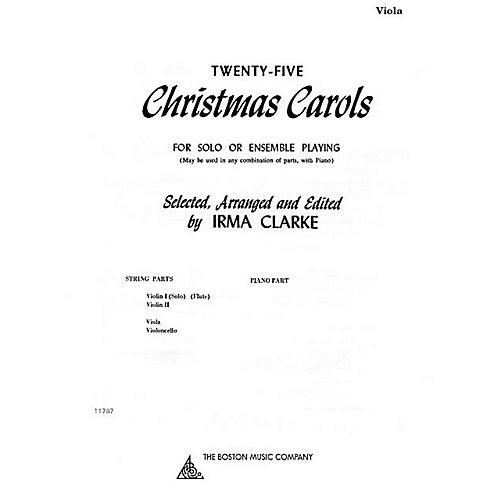 Designed for players in schools, churches and home, this elementary level collection includes 25 carols in arrangements for strings with lyrics included. Contents: Silent Night · O Come, All Ye Faithful · The First Noel · It Came Upon the Midnight Clear · Good King Wenceslas · Hark! The Herald Angels Sing · O Sanctissima · Let Our Gladness Know No End · March of the Kings · Sleep, Little Dove · The Seven Joys · Lay Down Your Staffs, O Shepherds · Lo, How a Rose E'er Blooming · Here in a Stable · Joseph, Dearest Joseph Mine · Although You Are So Tiny · Coventry Carol · Bring a Torch, Jeanette, Isabella · We Three Kings of Orient Are · O Little Town of Bethlehem · Away in a Manger · God Rest Ye Merry, Gentlemen · Joy to the World · Angels We Have Heard on High · Song of the Bagpipers.